Cockroaches are a high risk pest to have in the home. They carry a range of serious illnesses including salmonella, dysentery, gastroenteritis and typhoid. The risk is particularly high in homes with children, the elderly or those fighting illnesses. 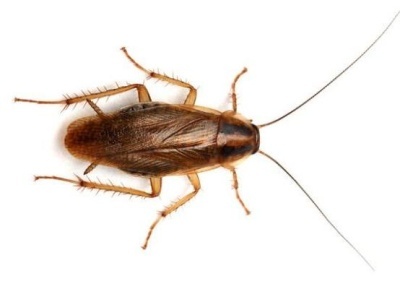 Cockroach droppings also cause eczema and asthma.Beyond the health risks, cockroaches are a distasteful pest to have in the home. Not only are they disturbing by sight, but cockroaches produce an obnoxious odour that taints food and objects they come into contact with. Cockroaches can breed rapidly and are highly resilient. A quick response is essential to ensure a cockroach infestation does not become established or spread to neighbouring properties. American Cockroach – 20-30mm: the American Cockroach is reddish brown in colour and has a pale yellow area around the perimeter of the pronotum. These cockroaches tend to be found in dark, undisturbed areas that are high in humidity. Seeing live insects – cockroaches are nocturnal and hide during the day. You will most likely see them when turning on the light in the kitchen at night. Egg cases and cast skins – cockroaches shed their skin 5-8 times as they mature. Droppings – cockroaches leave a dust of black droppings less than 1mm wide and of varying lengths. Damage – cockroaches will attack organic goods including leather and books. 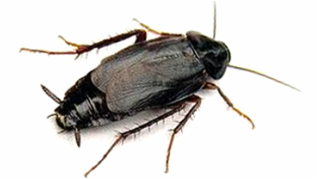 Cockroaches are very resilient and while DIY products can deal with the immediate problem, treatment by a qualified pest control technician is often necessary to deal with cockroaches over the long-term. Swift Pest Solutions technicians have a range of powerful insecticides to deal with cockroaches. We also minimise the risk of insecticides in the home with proprietary products such as Diatomaceous Earth which is targeted at the crevices where cockroaches hide.